The most useful sentence to learn in any language is: "My friend will pick up the tab." 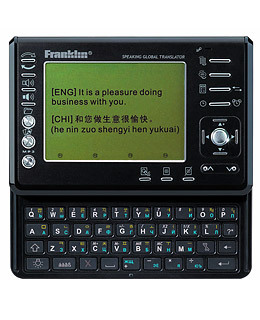 Unfortunately, that's not one of the 12,000 pre-programmed phrases on Franklin Electronics' 12-language Speaking Global Translator, although you could certainly piece it together from the 450,000 words stored in its memory. With its dim screen and clunky interface, it may take you some time to get the device to shout, "That man just stole my wallet!" in Russian or Italian, but what are you going to do if you get pick pocketed one of those quaint corners of the world where nobody speaks English? If the tiny keyboard defeats you, Ectaco makes a high-end, $759.95 speech-recognition model with a hand-held scanner for inputing text.